A comprehensive account of what came after the armies marched away from Gettysburg, the largest battle fought on the American continent, detailing who cared for the wounded and the dead, and how the citizens coped. Gregory Ashton Coco, born and raised in Louisiana, lived in the Gettysburg area for nearly 35 years. In 1972, after serving in the U.S. Army, he earned a degree in American History from the University of Southwestern Louisiana. While in the military, Greg spent a tour of duty in Vietnam as a prisoner of war military interrogator and infantry platoon radio operator with the 25th Infantry and received, among other awards, the Purple Heart and Bronze Star. During his years in Gettysburg, Greg worked as a National Park Service Ranger and a Licensed Battlefield Guide. He wrote sixteen books and a dozen scholarly articles on Gettysburg and the Civil War. His A Strange and Blighted Land. 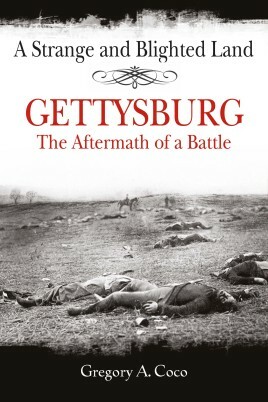 Gettysburg: The Aftermath of a Battle was voted #12 in the Top 50 Civil War Books ever written.Greg died at age 62 in February of 2009. In his words, he was “the happy husband of Cindy L. Small for 26 years. He was the fortunate father of daughter, Keri E. Coco. He loved them both with all his heart.” Keri is married to Cail MacLean and they have a daughter, Ashton MacLean Coco.